I have been doing a lot of research on YouTube recently about this "Black Goo". This scientist claims that sometime in our distant past someone engineered our existing oil and altered it at a molecular level. He makes many good points, and when it comes to nano tech, and genetic engineering, we are just scraping the surface with our understanding of these technologies as human beings. At the conference the speaker believes from different sources that we are dealing with your unconventional aliens, and they don't come from a far off planet, in a different solar system, that Keplar knows about...No... These 'aliens' are said to come from a different dimension. I am going to try and make this as simple to understand as possible, as I am sure you are aware of David Icke, and his slightly off the wall approach to the blood sucking reptilian matrix, that are out to make you fight, and be angry and miserable all the time. This way they can feed off your light force....however, surprisingly, he is not far off from the truth. Lets talk about Morgellons. A morgellon is a fiber that has been protruding from people's skin lately and is a new form of hybrid biology. It is in a group all its own, like a fungus, parasite, or even bacteria, these little guys are airborne infesting our body through the air we breath. These things are not naturally occurring on our planet (at least not at their present form). Someone, or something has engineered these things.... The official wikipedia page calls Morgellons Syndrome basically a paranoia but it does says fibers protruding from the skin? So which is it then? So once we are affected with these morgellons fiber through aerosol based chemical spraying given to us as messages from an 'alien species', they we have been further bio engineered, from an unknown extra dimensional alien race. They are almost evolved enough... living creatures, they are like programs, that we breath every day through chemtrails. When these things mature, they become like spiders in your lower intestine. They even have sexual organs and are male or female. The crazy thing we can not carry more than 2 in our stomachs. These are the things that are feeding on our fear, anger, and hate. I am not saying that reptilians don't exist and I am not trying to knock anyone's research, but this makes a lot of sense. The embryos will grow in human male and females alike. We have all been infiltrated. 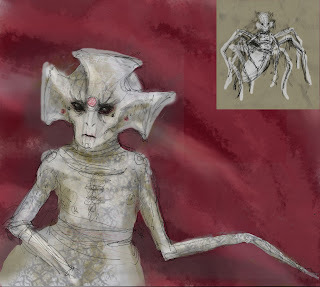 So lets go over what we learned, these morgellons we breath in, from some type of delivery system (such as chemtrails), we become carrier (eventually) to a new matured alien spider that grows in our intestines. They are psychic and feed of of our very essence, our life force if you will (more bluntly are human feces). They are also programmed, very technical and work off of frequencies, these things are turning us into antennae that can receive signals, and we can have things like a heart attack, become poisoned and even die instantly, all because these things have been in our air since 2003. Their agenda? to take over our body as hosts. Everyone on the planet has them inside them. I think they were introduced to our government by an alien species, and our government, or some government of this planet, was given a back door code, so that they can shut off the morgellons nano tech network....They were lied to. The aliens, or creatures from another dimension I should say, had no intentions of putting in this back door. We have been compromised, our very thoughts emotions and everything else is being fed back into the oil goo of the planet, and ultimately back into the hands of our controllers. Every planet in the universe has black goo deep inside it's core. This is essentially what all living things turn into (even possibly humans) after their death and millions of years later we have oil which is a 'fossil fuel'. All of our past emotions, experiences, and memories is stored within that oil. What if a more advanced alien race has already figured this out? What if they learned how to harness this databank or network of stored data in our planet's databank? Who cares if its with genetic engineering, or how. The fact is it has already happened to our planet. An alien race has hacked our database. They could quite possibly not even be from another planet, They could be right here in front of us, out side of our visible light inside the multiverse, and they are multidimensional beings. These guys not only hacked our planetary database, but with the morgellons, they have us all hacked in real time, and eventually fully 'rooted' or compromised as human beings. Scientists, need to stop taking bribes from big corps, due some real analysts be be a super hero. Show the world, that we have been manipulated. At a grand scale. What does all this mean? I am not too sure yet, I will keep everyone updated. Please post any feedback you have on the subject. Thanks for reading.